Social media marketing strategies are super important for businesses of all sizes, and if you’re going to succeed online, you’ll be needing one. It’s a good thing you’ve come to the right place then! The key to a successful social media strategy is to follow a plan which fits your business and your lifestyle. For instance, a large corporation may have plenty of time to write incredible blog posts which gain loads of attention across social media (which is great!). However, a sole trader, freelancer, or a brand spanking new start-up business probably won’t have that kind of time (or workforce!). They may be better suited to a more interactive style; getting involved with social media communities, retweeting other small businesses to increase engagement (or RT’ing as the cool kids say) & generally doing a lot of mingling. 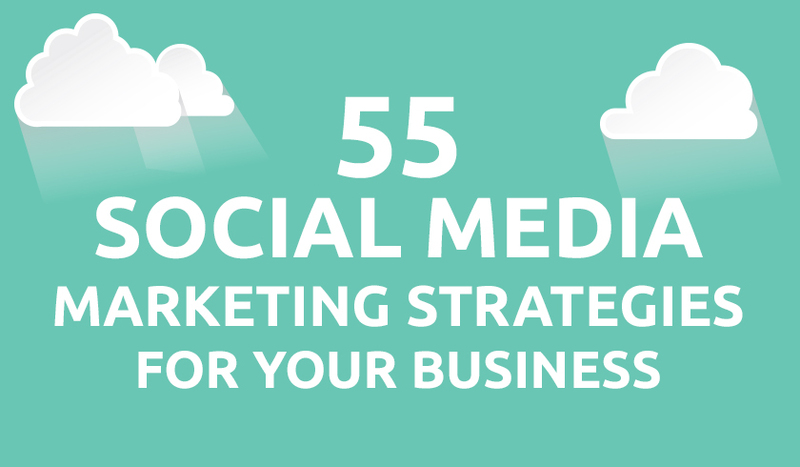 Below is a list of 55 social media marketing (smm) strategies that you will be able to implement at your business. Whether you’re all about big business, or you’re dipping your toe into business for the first time, there’s bound to be something here that will suit you perfectly. This article is updated regularly with brand-spanking new social media tips – so be sure to bookmark it for future reference! Browse by Category: Simply click the links below to jump to that category. It makes sense to kick off the list with this one! Most small businesses & sole traders will think the first step to a successful social media presence is signing up to every social network under the sun. You’re going to be working hard with the day-to-day runnings of your business anyway, so why all the added pressure of managing a dozen social media accounts? You’ll eventually get to a stage where a few accounts will begin to slip and become stagnant – and there’s nothing worse than customers landing on your businesses Pinterest page to find it hasn’t been updated for 6 months, as it reflects badly on your brand. I’d argue Twitter is as well, if you’re looking to reach a huge amount of potential customers in a short space of time (something which is infinitely more difficult on Facebook, yet Facebook is still a necessity!). After those two, it depends entirely on your business sector. For instance, if you’re selling customised animal portrait cushions (sounds amazing, by the way), you probably won’t be needing LinkedIn. Instagram would be a perfect fit, though. Likewise if you’re a construction company – I doubt #groundworks or #buildingdrainage are very popular(!). Opt for Facebook, Twitter, and another suited to you. You can always add more in the future. Getting that plan in place before you start posting will help your business look like a well-oiled machine, as opposed to a random series of posts. Very important this one, and it’s regularly overlooked! Speak to other businesses, even competitors, and your name will begin to get recognised by potential customers, who may see your product or service as better than your competitor! It’s been proven time and time again that images & video get a better response than just plain old text. If it’s relevant, drop an image in. An incomplete profile looks shoddy and unprofessional. Be sure to have a 100% complete profile on every social network you’re a part of. Get your Facebook page verified and receive a little tick next to your name! Not only does this build trust, it looks cool as well. You can also verify using a valid business document. This is a great one if you’re offering a service to people. Many people don’t realise you can call people via Facebook Messenger. Make the most of it by offering free advice (that you’d normally charge for) by randomly choosing a few people who comment on your post. You could post something like “Want me to call you for a free phone consult? I typically charge £X per hour. 9. Got a post that’s performing well? Promote it! If one of your posts on Facebook is receiving a tonne of likes, shares & comments, it might be worth promoting it. Generally if it’s performed well organically, it’ll perform brilliantly as a promoted post. Even better, you don’t have to spend much to reach a massive audience. As an example, we recently spend £10 on a post of ours which reached 12,500 people, recieved over 1000 post engagements and created a lot of interest! A lot of people interested in your product or service will check your Facebook page. To earn their trust (and hopefully get a new customer), you’ll need a few positive reviews on there. An empty review section may put them off buying from you. You’ve seen them – those posts that say at the end ‘What do you think? Let us know below!’. Just a simple line like this can give readers a feeling of involvement, and so they’ll be more enticed into writing a comment on your post. Twitter hours are specific times of the day where a bunch of people use a specific hashtag to have a chat and help each other out. Getting involved with these hours regularly can give your business a huge boost in followers and impressions. Some businesses solely tweet about themselves. This is fine, but unless you’re already a leading name in your sector, you’re going to struggle to get noticed. Retweet other businesses and a sign of goodwill & hopefully they’ll do the same. You’ll soon start noticing your follower count and impressions increase. Find someone who’s relevant to your business, follow them, and take a look through their Twitter lists. Twitter has recently allowed businesses to have a blue badge on their Twitter page. Having this will build both trust with your customers & looks damn cool. Fill out this form and follow the instructions. There are many different awards that you can win on Twitter – something which usually anyone can take part in with a simple tweet. Not only will you get a cool badge and bragging rights, you’ll also receive a good amount of promotion. I use Twitter to network. I take part in a lot of Twitter chats, chatting, retweeting, and sharing my own promo. I have won a handful of Twitter awards like this, such as King Of and SmartSocial. I am also a winner of #SBS – Small Business Sunday – set up by Theo Paphitis by tweeting him my business on a Sunday, and as a result my social media has grown significantly and I have gained a lot of new returning clients. Not only will it save you valuable character space, it allows you to track engagement as well. Got a pet? Instagram them. People love a cute animal to follow. Use this to your advantage. 19. Got a fancy workspace? People love to see nice desks/work areas/offices! This is what meme accounts are for! Fuzzy, badly-lit photos are only going to lose you followers. Built up a bank of pictures you can dip into a later date. Get out in your local area and photograph it whilst it’s looking its best. Stock up on well-lit photos, natural light is your friend. Hashtags will help you get your business out there for your target market to see. Aim to use hashtags that your customers would use. If you sell knitting products, find out what the knitting community are really into at the moment, and aim some posts at that area. Overusing hashtags is a big no-no. I’d recommend around 3 on Twitter. You might be able to get away with a few more on Instagram though. Pretty simple, isn’t it? Chat to customers – after all, they’re into the same stuff you are! Be sure to reply to any negative comments you receive as well. If you’re solely posting content trying to sell your products, people will get bored and stop following you. Post interesting content that hooks your followers, and sprinkle it with the occasional promotional post. People love behind the scenes content! Posting the odd behind the scenes photo or video instead of pushing your product can help build trust in yourself and your brand. A lot of people may overlook Snapchat when it comes to their social media marketing strategy, but you shouldn’t! Snapchat is a new one I’m trying out, and it’s a much more personal blogger platform, but it works so well with ‘Exclusive’ behind the scenes footage. YouTube is the world’s second largest search engine after Google, and it’s not all cat videos! If you’re looking to enhance your social media marketing strategy, you could incorporate YouTube videos into it. Longer videos tend to perform better than shorter ones, helping to push you up the rankings for your chosen topic. Session time (the amount of time a user remains on your video) is key to YouTube success – which is why those longer videos outperform shorter ones. Be sure to send people to your blog as often as you can. Turn your blog into the authority on your subject area, and utilise social media to build up the traffic. Inkeeping with the above – push people towards your website when necessary, to turn potential customers into paying customers. If your competitors are outmaneuvering you, then look at their strategy and do one better. Thousands of successful social media marketing strategies have been built on simply following an already successful one, and just adding that little bit extra. Are they posting great photos? Great, start posting your own too. Perhaps they’ve written a brilliant article? Write your own articles & make them even more interesting than theirs. By being one step behind, you’re in a unique position to beat everything they do. Take advantage of that. A simple ‘how are you?’ could turn into your next customer. It’s not the cost of something that determines the sale, it’s how the customer feels. Don’t be the one sitting in the corner. My biggest thing is a personal approach. I like to speak and interact with my network over Social Media, and let them know I’m actually taking note of their content. Twitter I would say is the best at the moment as you can include and clickable link, and have quick conversations. You want a clean, attractive social media profile. Including a link in your post has proven to increase clicks time and time again. When appropriate, add a link. Content curation works. Repost (or retweet if you use Twitter) interesting posts and updates from other influencers can help you boost your own social media channels. Chances are, your followers care about your quality content more than the issue of original vs. curated. Talk about your favourite local spots, upcoming events & new places to visit. I must stress that you shouldn’t use these systems to spam people, as it’ll do you more harm than good. There are plenty of tools out these that will help you auto-follow people that may find your content interesting and useful to them. Plus it can be a great timesaver. Autopost systems such as Tweet Jukebox allow you to create a database of Tweets that will be posted randomly at regular intervals, a huge timesaver! These kind of systems should only really be used if you do not have any time at all to regularly post. Just be sure to refresh your posts regularly so you’re not posting the same stuff over and over again. Tweetdeck is a great little tool for scheduling posts. Certain times of day may be more effective at reaching a larger audience than others. Research your own analytics as well as other businesses’ to see what times would work best for you, and schedule posts for those times so you don’t forget to! Whenever you post a new blog article, or add a link into a tweet or Facebook post, you want the preview to look good. This normally means creating a featured image to drop into the preview. To save time, and to make your brand consistent across all posts, create a featured image ‘template’ – something that represents the brand and can be easily altered for a new post. There are a number of products on the market that will allow you to send over a personalised message to anyone that starts following you. These are great just to give a little thanks to your new followers, and will make them feel special – something which could translate into more sales! People love free stuff! Offer up a free product for a simple action, such as liking/following or retweeting and so on. Just be sure to abide by the competition rules & regulations of the social network you’re posting on! Most of the time they will be more than happy to – they’re following you for a reason after all. Reward your fans with exclusive discounts! Not only will they feel more connected to your business, you’ll increase your sales too! Bonus! If you regularly post interesting & informative topics/media that people enjoy, you’ll gain tonnes of followers. Looking to create a piece of content that will go viral? Perhaps a really cool blog post that you’ve written? Well here are a couple of facts and tips to help you along the way. If the content you’ve created is on your website, be sure to use really prominent social buttons for it. You want to make it as easy as possible for the person viewing it to share it. If you’re writing an article, make it practical. Practical articles are 34% more likely to go viral than other article types. Make your content THE BEST. Search for your topic in Google and see what’s currently at the top, then see how you could make an even better one. Perhaps your topic is the best guitars. ‘Best Guitars’ has the top result as the 37 best electric guitars. Why don’t you aim to write about the 50 best guitars? This technique has been proven to work brilliantly. Put simply, competitor analysis involves having a good look at your competitors & making notes of their best and worst points. From there, you can work to enhance your own marketing plan by using some of their best-performing areas, and improving on their worst-performing areas. The aim of competitor analysis should be to ask yourself, ‘Why are they doing better than me?’. Once you’ve answered that, you can begin to make progress towards offering a better service/product than your competitors. Are you trying to get your awesome pair of sunglasses to sell, but you’re simply not getting your name in front of enough people? Influencers could be the answer. Influencers are people with huge followings, who fit well into your area of business. Those sunglasses you’re selling would look great on a celebrity – so send them a free pair. Kissmetrics have a great article on influencer marketing that you can read here. Taking a look at older content, reviewing what performed the best, and focussing on those areas is one of the best ways to get high engagement. Use a tool such as BuzzSumo to view the best performing content for your chosen keyword, and jump on it! Dip your toe into email marketing to accompany it with your social media marketing. Email marketing is what I base the network on for Liverpool Bloggers, and this is definitely the place to be. I instantly see success when time is put into this area. Our social media strategy has been heavily influenced by the pages we follow. We really like the way BuzzFeed etc get their point across with catchy titles, intriguing headlines and the occasional pun. Who doesn’t like a good, pun? For us, it has been about adopting parts of their strategy and providing a little local Liverpool BuzzFeed. Time of the day is quite a tricky one. Personally, I don’t really do morning posts. We’re more late afternoon and evening. In the morning everyone’s too busy trying to feel normal, drinking copious amounts of coffee and eat porridge to digest us on top of that. I’m always trying to capture the “just finished work” crowd. Liverpool is well documented as a non-planning city. We’re a bunch of spontaneous folk who go out on the Monday night and couldn’t care less about the Tuesday morning as George Harrison famously said. They like instant information they can act on and they like experience. They like to be the first to have done something or to be part of a small group of people who have experienced it. In the digital age, our level of distraction is huge so we want people to be able to instantly act upon what we’re putting out there. We always tried add a level of humanity too. It’s not robotic, formulaic or feels like it’s coming from HootSuite. It’s just two lads, putting our opinions out there, having a laugh and hoping people will want to visit the Liverpool we’ve chosen to document as a result. If you enjoyed this article, please feel free to share it across your website & social channels! Do you have any social media marketing strategies of your own? Let me know by replying to this comment!